Multi-functional easy to use camping light. The 20 LED light is easy to hang to a parasol or in a tent with the attached hanger. Multi-functional easy to use camping light. The 20 LED light is easy to hang to a parasol or in a tent with the attached hanger. 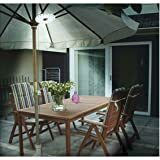 Ideal to light a table and play a game outdoors.